Have you ever been into an Asian grocery store and been intrigued by packages of things you have little to no idea of what they are? 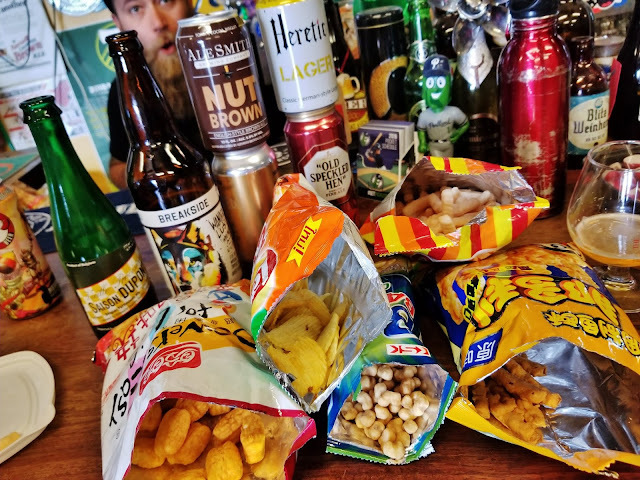 We make periodic trips to our favorite, Hong Phat out on SE 82nd, to stock up on pantry staples and are drawn to the salty snacks aisle where some bags' contents are understandable through pictures and/or English labels while others remain a mystery. 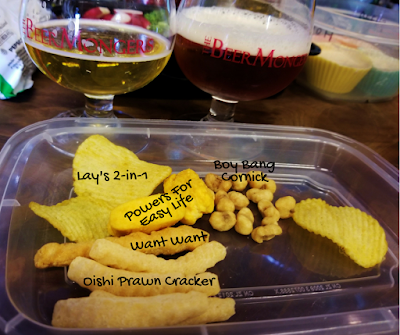 After our recent pairing with coffee creamers, grabbing some random salty snacks from Hong Phat didn't seem too odd. As we were inspecting the bags more closely before opening we noticed that we had ended up with an unintentional geographical assortment - two from China, two from the Philippines and one from Thailand. We haven't seen Lay's 2-in-1 in this country but upon opening discovered that the two seasoning flavors, prawn and salsa, weren't combined onto each chip. Instead the larger, redish chips were prawn flavored and the smaller, greenish chips were salsa (verde) flavored. The prawn flavor being very pronounced was off putting for a couple of those in our group but made for an interesting combination with the flavors and carbonation in Saison Dupont and helped to balance the overt maltiness of Old Speckled Hen. The salsa flavored chips were easier to pair, going well with Heretic Lager for a mild Mexican-ish pairing. When eaten with Culmination Sour Flower the green onion of the chip came out a la onion ramen. 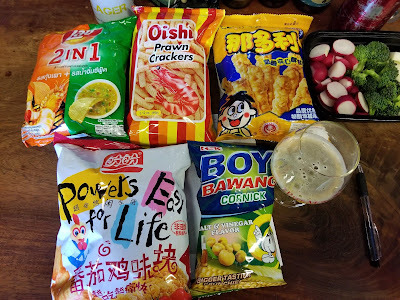 Boy Bawang Cornick Salt & Vinegar appeared from the picture on the label to be similar to corn nuts and indeed they were. Their flavor profile was strong enough to stand up to the hops in Breakside Wanderlust and made for solid bar snacking material. They were similarly good with AleSmith Nut Brown and like the Lay's 2-in-1, were able to balance the maltiness in this beer. Oishi Prawn Crackers were not nearly as prawn-powerful as the red chips in the Lay's bag and found partners in lighter drinking options including coffee, Heretic Lager and Cascadia Granny Smith cider. The cider made the prawn flavor more pronounced but even the prawn-averse in our group enjoyed the light, easy pairing. Powers for Easy Life Rice Crackers with Tomato easily had the best name of the group although the contents of the bag were probably the least enjoyable. We settled on a description of a salty version of breakfast cereal, either Corn Pops or a mild version of Capt'n Crunch. Although we have paired beer with cereal, this salty hybrid had a hard time finding a partner. 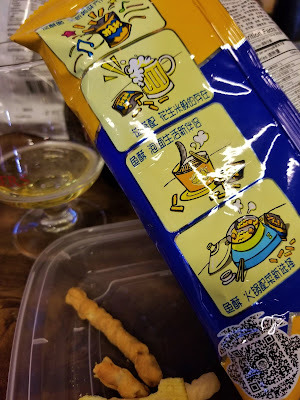 Saison Dupont seemed to be the "best" by making the snack less cereal tasting. All of the other beers as well as the cider accentuated the sweetness, resulting in flavors ranging from chocolate Sugar Pops to Apple Jacks. Want Want Natori Snack ---> had the second best name but definitely the best illustration on the back of the bag, giving us hopes that these were going to be The Snack. What we found upon opening the bag were sticks that looked like battered french fries but had a very mild flavor reminiscent of those crunchy chow mein noodles we've all had atop a Chinese-ish dish. Not surprising, both the mild Saison Dupont and the Cascadia Granny Smith made for appropriate pairings. 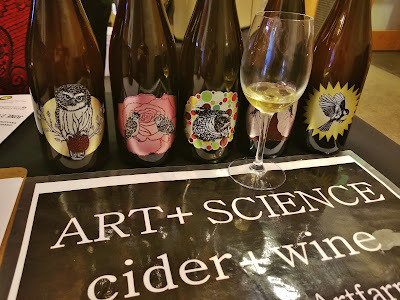 Thanks again to Chris, Mag, Paul, beertender David and others who were willing to go along with our wacky pairings once again! 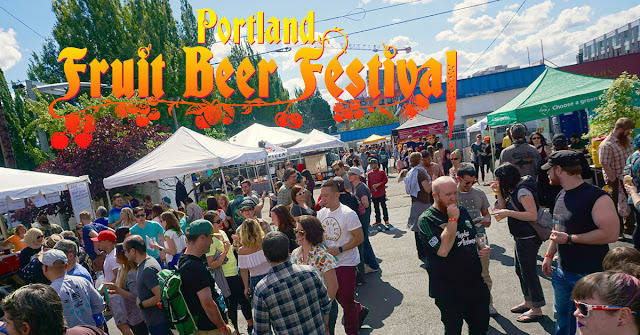 Now in its 8th year, the Portland Fruit Beer Festival returns to its original home at Burnside Brewing on the east side after a one-year excursion across the river. 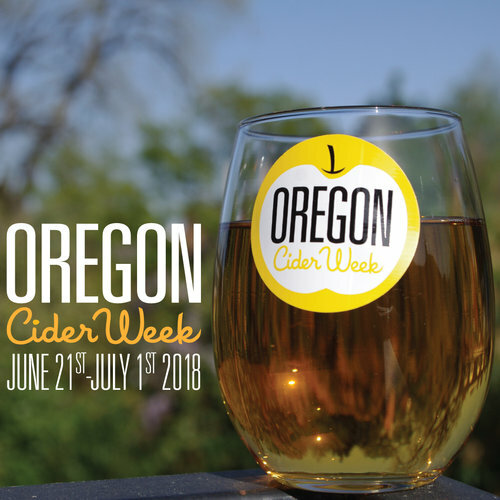 Pouring more than 50 interpretations of fruit beer/cider, the offerings will span a variety of styles from sours and lagers to IPAs and stouts, utilizing all manner of fruits from commonplace to obscure. 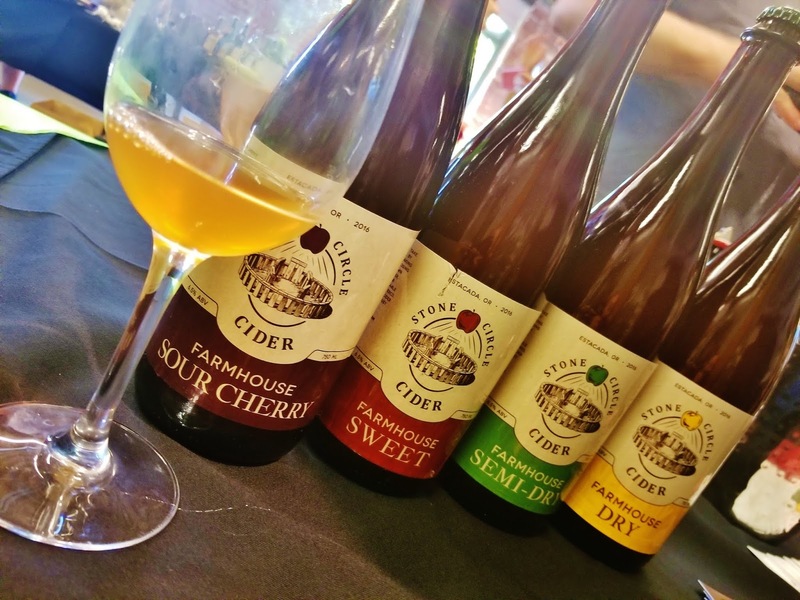 We recently had the opportunity to try a sampling of the beers/ciders that will be poured at the festival and were impressed both by the brewers' creativity and their skills. Cider Riot! 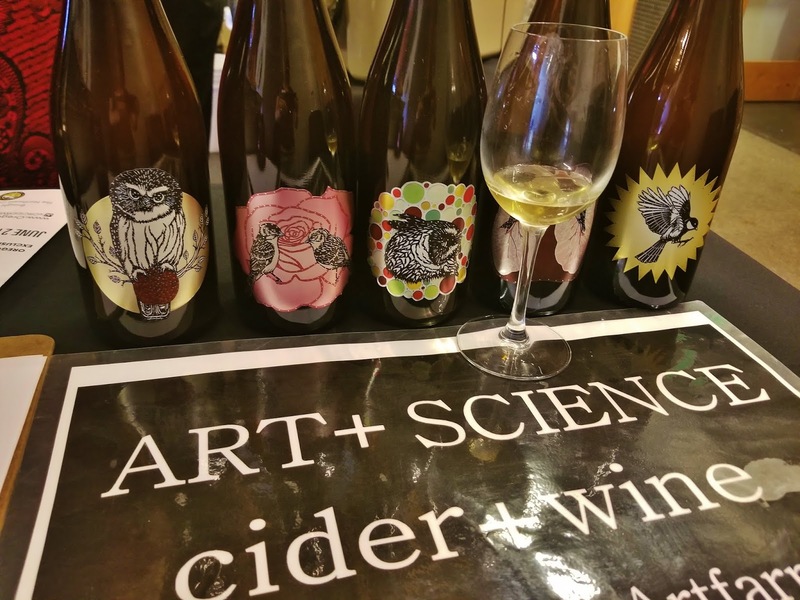 Everyday Passionfruit - A back-sweetened, semi-dry cider, it is a less tart version than last year's and displays the mild flavor of passionfruit in an easy-drinking 6% cider. Claim 52 Skrrrrrt - Using a mild Gose base, one could easily mistake this 4.2% pineapple and passionfruit beer for a glass of juice. A very tasty glass of juice. 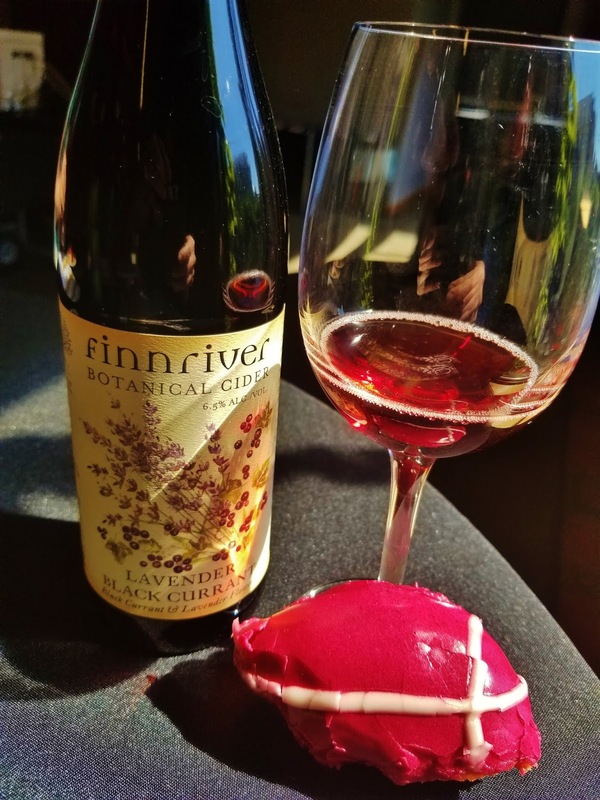 Finnriver Berry & Bard - Combining heirloom, organic Washington apples with Olympic Peninsula rhubarb and aronia berries grown at Finnriver Farm the result is a fruity yet tanic/dry cider. Hopworks Strawberry Milkshake IPA - Light-handed use of strawberries and lactose meld with berry-forward Australian hops and tropical Pacific NW hops in this 7.4% fruited IPA. Reverend Nat's Blood Orange Viva La Pineapple - Taking things to another level, Nat put his festival-exclusive version of blended apple and pineapple juice into a slushy machine. So drinkable and fun, beware of a brain freeze! Von Ebert Starcloud - Starting with their Sector 7 IPA made with Mosaic, Simcoe, Citra and Galaxy hops, tropical starfruit was added, resulting in a smooth and lovely 7.1% hazy IPA. Buoy Saison de Gewurtz - The buckwheat Saison base beer spent five months in Willamette Valley Pinot Noir barrels with house Brettanomyces cultures spiked with Oregon-grown Gewurztraminer juice. For the first mixed culture project released, Buoy is starting off with a bang. Make sure to have this delicate 4.9% offering early on. Gigantic Brewing Gigantic & Juice - An updated version of the G&J made last year, the lightly juiced beer contains balanced amounts of pineapple, tangerine and grapefruit. Widmer Strawbarbaric IRA - One doesn't see many India Red Ales in general and this version brings together strawberries and rhubarb with "red fruit nuanced hops" - Hull Melon, Mandarina Bavaria and more. 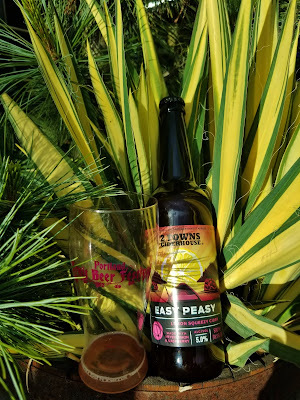 2 Towns Easy Peasy - The first citrus cider from 2 Towns, it's a limited release offering that drinks like adult raspberry lemonade with a tartness coming from the Meyer lemons and Lactobacillus culture. Allegory Sunshine Slammer - This POG (passionfruit, orange, guava) was crafted with a session outdoors in mind, deriving its sourness from a Lactobacillus pitch. 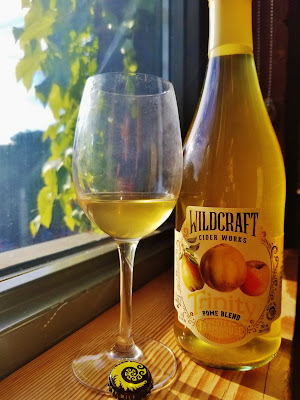 One of the more [deliciously] sour offerings we tried! Great Notion Blueberry Muffin - Known for their kettle-soured Berliner Weisses, it has a bright, blueberry tartness that if one has the chance, pairs well with an actual blueberry muffin. Lompoc/Fruit Beer Fest/Repurposed Pod collaboration Cacao Cream Ale - Cacao pods are generally thought of as the starting point for chocolate but using the juice from the fleshy portion of the fruit and the cacao nibs from the seed portion this beer is a mind-expanding creation. Hazy apricot in color with an aroma that hints mildly of chocolate, this cream ale is perfectly fruity and drinkable. 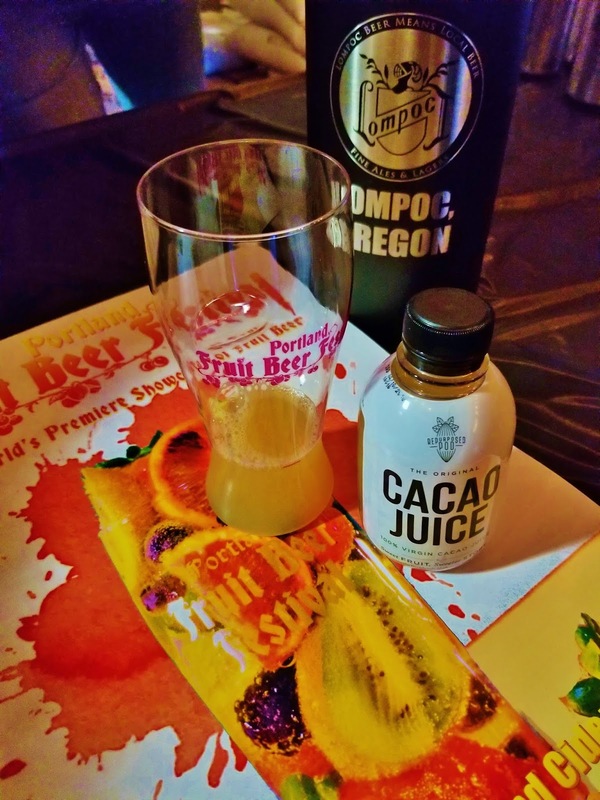 Representatives from Repurposed Pod were involved in the blending process and Lompoc is only the second brewery in the U.S. to use their Cacao Juice (Tired Hands in PA being the other). 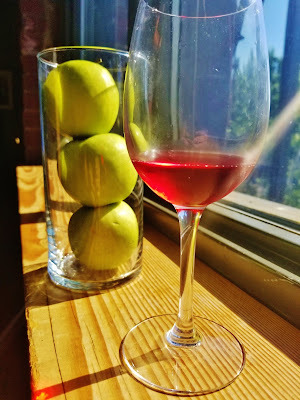 Migration Manhattan Transfer - If you're looking for a cocktail, Manhattan Transfer is the beer to have. The 7.9% cocktail beer was fermented on freshly emptied rye whiskey barrels with "heaps" of cherries and vermouth-infused oak and botanicals. The festival starts on Friday with a five-hour preview session (20-ish beers/ciders) and goes into full festival mode Saturday and Sunday spanning Burnside Brewing's parking lot, a portion of NE 7th Street and the parking lot adjacent on the west side of the street. 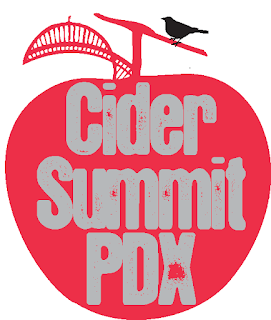 30 core beers and ciders will be pouring throughout with three to four rotating rare and special tappings. 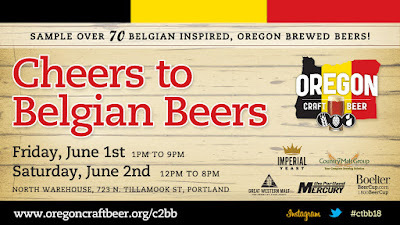 Pours will range from one to three tickets in cost with additional tickets available for purchase. The 2018 Cheers to Belgian Beers festival will feature 75 breweries, all of which were subject to a dart throw to determine if their beer would need to adhere to "dark or light in color" and "low or high in alcohol content." Dart masters, the ones who hit a bulls eye during the throw were rewarded with selecting their own color and strength. The majority of the beers will be using this year's chosen yeast strain, Precious, as their primary yeast strain. It's a classic Belgian yeast that features a very mild phenolic character balanced with moderate fruitiness. Ground Breaker D'oh! Flanders Red - We're not gluten-free but we're interested to see what a gluten-free version of one of our favorite styles is like. Mad Cow Off the Griddle and Into the Mash - If nothing else, we gotta give them credit for using Belgian waffles in the mash and real maple syrup in the finish. Occidental Kunstgreep - "Brewed using a mysterious process"? Yeah, that's a good tease. Solera Lotion In The Basket - You had us at "feremented with several strains of Lactobacilli." StormBreaker Van Damme That's Good - We do like chocolate in our beer and our curiosity is peaked with the use of cocoa powder in the kettle and liquid cacao in the bright tank. The Ram Brewery Rare Commodity - Apricots are one of our favorite fruits used in making a beer as they tend to impart both a fruity flavor as well as a lovely, smooth mouthfeel. Vagabond Little James & The Giant Peach - Peaches are a close second to apricots so it would be fun to try these two back to back. Widmer Raspberry Quintuple - Raspberries and chocolate clocking in at 15%? It will either be amazing or amazingly bad and there's only one way to find out. Now in its 12th year, the festival returns to The North Warehouse and will once again feature an outside tented area with food to be had from Urban German Grill and Monk's Deli. Entry to the 21+ event is free but in order to imbibe tickets are $20 and include beer goblet and 8 tasting tickets, available at the door. 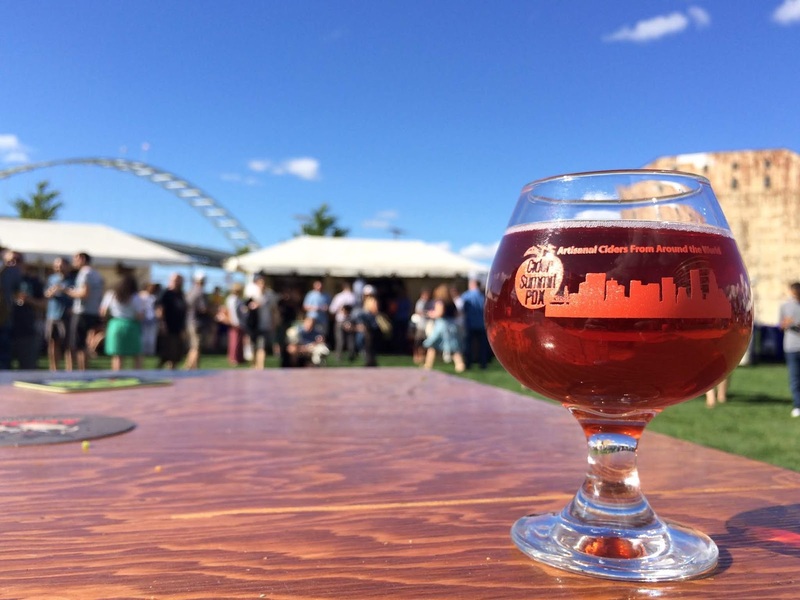 And as per usual with festivals around here, additional tasting tickets will be available for $1 each.